Photo courtesy of Adam Coates. Found at buffet in Bangkok, Thailand. A horse! A horse! 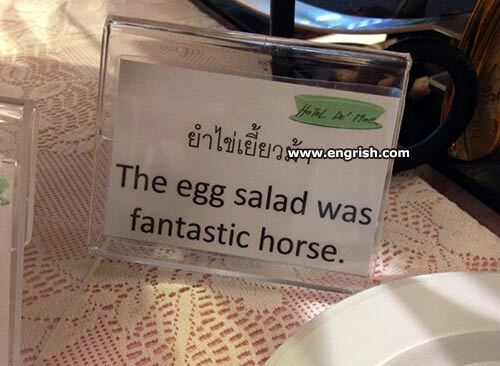 Egg salad for a horse! It was fantastic, and we don’t want to hear from any neighsayers. Egg salad was a late entrée into the race but it won. I’ve heard of horse hockey. A good egg salad always includes chopped green stallions. Is it the mane course? @Pete | 4:18 am: The famous Mr Egg? If you find a large oblong quadruped with a leg at each corner in your Egg Salad….I have news for you. Waiter waiter! There’s a Horse in my Egg Salad. I have won many bets on The Egg Salad. Unfortunately, its rider was Humpty Dumpty and one day, he fell off the horse. Egg salad gives me the trots. Some practical joker’s just trying to stirrup trouble. This gives me mixed feelings. Mixed Feelings = How you feel when your mother-in-law dives off a 500 foot cliff in your new Porsche. That would not be as big a surprise, as finding a foot in your muffin. Make a sandwich out of it by putting it on a Seabiscuit. Incidentally, contrary popular myth, Humpty Dumpty was not necessarily supposed to be an egg. It was probably a reference to a war cannon-which would cause the poem to make a lot more sense. Ladies ordering the horse may request side salad. @Long Tom | 5:25 am: Interesting! And apparently, in the story of the cannon, it was the wall that broke, not Humpty Dumpty. Horse Egg Salad, the other White meat! They missed a comma. The horse was the chef. Author Dana Simpson did her research. @DnT: But I cannot imagine any cannon surviving such a fall, even from a low wall. I’m sure they meant horseradish (grins nervously). Heroin- you’re doing it wrong! They put horse (heroin) in their egg salad to ensure repeat business. And this salad dressing is awesomesauce. After eating the egg salad the man was rushed to horsepiddle!